The main objective of this report is to analysis Foreign Exchange Transaction System. Other objectives of this reports are understanding the overall procedure of export & to familiarize with the issues in international trade, understanding & identifying the functions of Foreign Trade in Standard Bank Limited, over viewing & analysis of the performance of International Trade & foreign exchange, to acquaint with the Techniques, Laws, Principles, documents & precedence, adapted in financing the export & import business, foreign Remittance and Risk study. Finally this report make swot analysis Foreign Exchange Transaction System. Understanding the overall procedure of export & to familiarize with the issues in international trade. Understanding & identifying the functions of Foreign Trade in Standard Bank Limited. Over viewing & analysis of the performance of International Trade & foreign exchange. To acquaint with the Techniques, Laws, Principles, documents & precedence, adapted in financing the export & import business. Standard Bank Limited (SBL) witnessed a considerable growth in its overall business performances during the years 2004 to 2008. 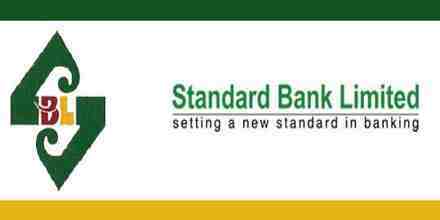 Standard Bank Limited (SBL) was incorporated as a Public Limited Company on May 11, 1999 under the Companies Act, 1994 and the Bank achieved satisfactory progress from its commercial operations on June 03, 1999. The Bank witnessed a considerable improvement in its overall business performance during the years 2004 to 2008. SBL has introduced several new products on credit and deposit schemes. It also goes for Corporate and Retail Banking etc. The Bank also participated in fund Syndication with other Banks. Through all these myriad activities SBL has created a positive impact in the Market and in the banking sector. The bank would serve as partner and advisor of the clientele to trade, commerce and industry. The mission of the Bank is to be utmost trustworthy, stakeholder, careful, committed for equitable and sustainable growth based on diversified deployment of fund/resources leading the bank to the peak of healthy and wholesome financial institution. The motto of the Standard Bank Limited is to explore a new horizon of innovative modern banking creating an automated and computerized environment providing one stop service and prepare itself to face the new challenges of globalization and 21st century. One of the main objectives of the Bank is to be a provider of high quality products and services t attracts its potential marker. The Bank also caters to the needs of its corporate clients and provides a comprehensive range of financial devices to national and multinational companies. The growing technological revolution in the bank is not so-distant future. We have already introduced SWIFT, online banking and we are also going to introduce ATM services and Credit Card services within the shortest possible of time. To be a dynamic leader in the financial market in innovating new products as to the needs of the society. To earn positive economic value addition (EVA) each year to come. To top the list in respect of cost efficiency of all the commercial Banks. To become one of the best financial institutions in Bangladesh economy participating in the most significant segments of business market that we serve. Deals in Development of human resources, controls total administration appoints banking personnel, promotes officers, maintains inter-branch transfer and works for staff and officers welfare. Implements Banking law and rules over all the department and branches. Mobilize the different deposit schemes and project through the branches, controls ATM Booth, Online banking etc. Provides loan and advances to different client on the basis of the recommendations of the branch managers. Deals in SME Banking, Credit restriction & Credit risk analysis, produces credit data’s retail banking etc. This is call the International Division which controls the Authorized Dealer (AD) branches, Approves Import and Export credits, receives foreign remittances, deals in foreign currencies, Negotiate the documents of exporters, deals in Foreign Trade & Foreign Exchange, maintains International Foreign banking agents etc. Collects different accounting information from different branches through different periodical statements. Prepares weekly & monthly statement of affairs, maintain Profit and Loss A/cs Assets and liabilities A/cs, Furniture and fixture A/cs, prepares yearly balance sheet of the bank etc. Deals in share, control share marketing issues dividend, bonus shares etc to the share holders. A group of skilled bankers inspect the branches round the year and audits the books of accounts, advances, foreign exchange dealers & performances of the branches and prepare reports on the aforesaid tropics to this department. Major irregularities are detected and reported to higher management for their next course of action. Uses modern electronic devices to maintain and produce different datas by inputting different information from different braches. Control Online Banking System etc. a) The Bank has commenced its operation on 3rd June, 1999 with an authorized capital of Tk 750 million and paid up capital of Tk 200. The authorized capital of the Bank has been enhanced to Tk 3000 million and the paid up capital amounted to Tk 1092.96 million as on December 31st, 2006. The total shareholders equity and reserve stood at Tk 1917.44 million. The capital adequacy ratio of the bank as on December 31st, 2006 was 16.68% as against the minimum requirement of 9% of which core capital was 15.34% against minimum requirements of 4.50% and supplementary capital was 1.33% which testifies to the sound capital base of the b bank. The capital adequacy ratio of the bank in the year 2005 was 14.46% of which core capital was 13.48% and supplementary capital 0.98%. The Bank has earned an operating profit 733.05 million during the year 2006 compared to Tk 616.34 million during the year 2005, showing an increase of 18.94%. The Bank has earned substantial amount profit during the last year compared to preceding year. The progress was possible due to the pragmatic policies and right direction of our Board of Directors as well as active support and co-operation of our valued client and Shareholders. The deposit base of the bank continue to register steady growth and stood at Tk. 14220.80 million as on December 31st ,2006 as against Tk. 12062.40 million as on December 31, 2005. It is an increase of 17.89%, the Bank has by this time achieved a stable and sizable deposit base and has managed its deposit and investible fund efficiently for the purpose of both liquidity and profitability. In addition to the normal deposit scheme, the bank introduce highly lucrative and attractive deposit scheme, to encourage and mobilize the deposit as well as for the benefit of the people. Our various purpose oriented deposit schemes have been appreciated by general people and have received popular response. Steps are being taken to further increase the deposit base continuously at a reduced average cost of funds. The total loans and advances of the Bank stood at Tk. 12634.12 million including bill purchase and discounted as on December 31, 2006 compared to Tk. 10183.9 million as of December 31st, 2005 showing an increase of 24.06%. The bank has been continuing to explore and diversity the area of operation to extend credit facilities throughout the year to the various sector of the economy. In distributing loans the Bank mainly concentrated on agriculture and fishery sector, wholesale and retail trading, hotel, restaurant, teal estate and service sector and transport sector. The total loans are grouped in Tk. 12507.32 million as unclassified loans and Tk. 126.80 million as bad/loss loan. The investment has always an inverse relationship with capital adequacy ratio although if contributes to the desired bottom figure. The size of the investment portfolio in the year 2006 rose at 1623.35 million including Government Treasury Bill and the other security bonds against tk. 1272.46 million showing an increase of 27.58%. Foreign exchange operation of the bank played a significant role in the overall business of the bank. During the year 2006, the bank has contribution in the country’s national economy after successfully handling of foreign exchange transaction viz. Import, Export and Remittance. In 2006 volume of import has significantly increased from tk. 16144.65 million to tk. 18269.57 million, which is 13.69% higher than last year, the volume of export business has tremendously increased from tk. 7569.13 million to tk. 10707.48 million which is 41.46% higher than last year and foreign remittance business also remarkable increased from tk. 204.26 million to tk. 565.12 million which is 176.67% higher than last year. The volume of total foreign exchange business has significantly increased from tk. 25879.68 to tk. 34003.77 million, which is 31.39% higher than previous year. Foreign Exchange as the means and methods by which rights to wealth expressed in terms of the currency of one country are converted into rights to wealth in terms of the currency of another country. Foreign Exchange means exchange of foreign products, services and currency between two countries. If we consider “Foreign exchange” as a subject then it means all kind of transactions related to foreign currency. In other wards foreign exchange deals with foreign financial transaction. Foreign exchange department is international department of the bank. It deals with globally and facilities international trade through its various modes of services. It bridges between importers and exporters. Bangladesh bank issues license to scheduled banks to deal with foreign exchange. These banks are known as authorized dealers. If the branch is authorized dealer in foreign exchange market, it can remit foreign exchange from local country to foreign country. This department mainly deals with foreign currency. This is why policy is department is called foreign exchange department. No country is self-sufficient in this world. Every one is, more or less, dependent on another, for goods or services. Say, Bangladesh has cheap manpower whereas Saudi Arabia has cheap petroleum. So Bangladesh is dependent on Saudi Arabia for petroleum and Saudi Arabia is dependent on Bangladesh for cheap manpower. People of one county are going to abroad for education, Medical service etc. Thus there is exchange of foreign currency. Export/Exporter: Export means flow of goods and services produced within Bangladesh but purchase by economic agent i.e. individuals, firms, governments of other countries. The persons/Firms sales the goods & services to another country is called exporter. An exporter of a country having a trade relation with an importer of another country may not have enough money to conclude the deal. He may as such need finance from the Bank. Export policy of Bangladesh is formulated by the Ministry of Commerce to provide the overall guideline and incentives for promotion of exports. It has been decided to formulate this policy to cover a three-year period to make then contemporaneous with the five plans and to provide continuity to the policy regime. However, the policy will be valid until the next export Policy is announced. If required, Government may review this Policy once in every year and may take decision as deemed fit. Commodity concentration: Very few commodities are occupying major share of our export. Only five exportable items i.e. Readymade Garments, Knitwear, Jute Goods, Frozen Foods, Leather provide more than 90% of total export earning of Bangladesh. Geographical concentration: The periphery of our export market is very narrow. More than 80% of our total exports to USA and EEC countries. a) To achieve higher growth rate of export by increasing exports to regional and international markets. b) To reduction of trade deficit by achieving exports target. c) To assist production of export items in competitive price to protect existing market and explore new markets. d) To make efforts for exploiting new opportunities offered by the liberalization and globalisation process in world economy. e) To diversify and improve the quality of exportable items. f) To simply the export procedures and rationalize the incentive structure to exporters. g) To develop the export-trade infrastructure and trained manpower. National Committee for Export: Headed by the Prime Minister and comprising Ministers of Foreign Affairs, Finance, Commerce, Industries, Planning, Jute and Textile. The committee will review the export situation and provide necessary direction and resolved problems. Export Council: Consultative body comprising of Chambers, Exporter’s Associations and institutions of public sector. Quota allocation for export of RMG. Participation in international trade fairs. Arrangement of fair and exhibition both at home and abroad. Arrangement of training programs for boost up exports. a) Duty Draw Back: Exporters of manufactured products are entitled to drawback after the export is effected the amount of customs duties and sales tax already paid at the time of importing raw materials. Duty may be returned under any of the three systems, namely Actual drawback, notional drawback and flat rate drawback. However, the flat rate method is a simply system of getting drawback and preferred by most of the exporters. In these systems payments will be made by the commercial banks immediately on receipt of exports proceeds on the basis of the principles laid down by the National Board of Revenue. b) Duty-free import of Credit Machinery: 100% export oriented industries located elsewhere in the country is allowed to import capital equipment without paying any customs duty. c) Bonded Warehouse Facility: Bonded warehouse facility has extended to all industries recognized as 100% export oriented industries. A bonded warehouse is a warehouse under Custom’s control. Imported raw materials are stored in the bonded warehouse without payment of duty and taxes on the first importation and subsequent exportation of finished goods. d)Sale of Goods Rejected for Exportation: 20% of the rejected goods of the 100% export oriented industries including leather goods and readymade garments will be admissible for sale in the local market subject to payment of usual duties and taxes. e) Duty-free Import of raw Material for Export Oriented Leather Industries: To encourage increase in including production of finished leather and export at competitive prices, customs duty and LCA/permit fees leviable on import of well blue and pickled leather by export oriented leather industries will be exempted. f) Income Tax Rebate on Export Earnings: 50% rebate on taxable income generated from export earnings is exempted through incorporation of a new provision in the income Tax Ordinance. Presently export credit is allowed at confessional rate of interest (10%) for a maximum period of 180 days. The time limit for repayment of export credit has been extended from 180 days to 270 days for credit to frozen food, tea and leather sectors by way of relaxing the condition of submission of firm contract/LC and treating working capital as export credit. The import and export trade in our country are regulated by the Import and Export (Control) Act, 1950. Under the export policy of Bangladesh the exporter has to get valid Export registration Certificate (ERC) from Chief Controller of Import & Export (CCI&E). The ERC is required to renew every year. The ERC number is to incorporate on EXP forms and other papers connected with exports. After getting ERC Certificate the exporter may proceed to secure the export order. He can do this by contacting the buyers directly or through agent. After communicating buyer, exporter has to get contracted (writing or oral) for exporting exportable items from Bangladesh detailing commodity, quantity, price, shipment, insurance and marks, inspection and arbitration etc. After getting contract for sale, exporter should ask the buyer for Letter of Credit (L/C) clearly stating terms and conditions of export and payment. Then the exporter should take the preparation for export arrangement for delivery of goods as per L/C and incoterms, prepare and submit shipping documents for Payment/ Acceptance/ Negotiation in due time. Import means the goods & services purchase by economic agent located in Bangladesh from economic agent of other countries. Financing of Import business stores with the contractual obligation between buyer & the Bank. Financing of import business is a major area of investment of a Bank. Import is the goods and services purchased by economic agent located in Bangladesh from economic agent of other countries. Under the Import and Export (Control) Act, 1950 the Government of Bangladesh formulates the Import Policy through Ministry of Commerce. It has, now, been decided to formulate these policies to cover a three-year period to make them contemporaneous with the three-year plans and to provide continuity to the policy regime. It can be reviewed every year if needed. Import Licensing: Import licensing for commercial importers and industrial importers is necessary. As an Authorized Dealer, Principal Branch is always committed to facilitate import of different goods into Bangladesh from the foreign countries. Import Section, which is under Foreign Exchange Department of the branch, is assigned to perform this job. And to serve its client’s demand to import goods, it always maintains required formalities that are collectively termed as The Import Procedure. When the importer accepts the Proforma Invoice, he/she makes a purchase contract with the exporter detailing the terms and conditions of the import. After making the purchase contract, importer settles the means of payment with the seller. And import procedure differs with different means of payment. The possible means are Cash in Advance, Open Account, Collection Method and Documentary Letter of Credit. In most cases, the Documentary Letter of Credit in our country makes import payment. Purchase Contract contains which payment procedure has to be applied. a) Cash in advance: Importer pays full, partial or progressive payment by a foreign DD, MT or TT. After receiving payment, exporter will send the goods and the transport receipt to the importer. Importer will take delivery of the goods from the transport company. b) Open Account: Exporter ships the goods and sends transport receipt to the importer. Importer will take delivery of the goods and makes payment by foreign DD, MT, or TT at some specified date. c) Collection Method: Collection methods are either clean collection or documentary collection. Again, Documentary Collection may be Document against Payment (D/P) or Document against Acceptance (D/A). The collection procedure is that the exporter ships the goods and draws a draft/ bill on the buyer. The exporter submits the draft/bill (only or with documents) to the remitting bank for collection and the bank acknowledges this. Then the remitting bank sends the draft/bill (with or without documents) and a collection instruction letter to the collecting bank. Acting as an agent of the remitting bank, the collecting bank notifies the importer upon receipt of the draft. The title of goods is released to the importer upon full payment or acceptance of the draft/bill. d) Letter of credit: Letter of credit is the well-accepted and most commonly used means of payment. It is an undertaking for payment by the issuing bank to the beneficiary, upon submission of some stipulated documents and fulfilling the terms and conditions mentioned in the letter of credit. e) Requesting the concerned bank (importer’s bank /issuing bank) to open a L/C (irrevocable) on behalf of importer favoring the exporter/seller. Financing of import is a major area of investment of a bank Financing of import business starts with the contractual obligation between an importer and the bank. The initial contract for this type of business starts with the merchandise to be imported. Inland L/C defined: Inland letter of credit is a written undertaking given by a bank on be half of its customers to pay up to certain amount of money to a supplier within the country on presentation of documents evidencing dispatch and receipt of merchandise in accordance with terms and conditions contained therein. Opening of inland L/C: Inland letter of credit is generally opened in favor of reputed and established firms, industries, agencies etc. for supply of merchandise against firm contract/ letter of intent /allotment letter. Application of the Party. A reputed party who is acceptable to the Bank shall apply for opening letter of credit along with a firm contract or letter of intent embodying the terms of the deal. The letter of credit is addressed to the supplied . The description of goods and the amount are clearly mentioned in the L/C as per stipulations embodied in the firm contract/letter of intent. Documents to be submitted on dispatch of the goods are clearly mentioned. Delivery arrangements and payment terms are clearly noted. Instruction for the negotiating bank is a properly given. Obtaining approval: If the branch is satisfied with the particulars mentioned above and the credibility of the party, L/C shall be opened with prior approval of the competent authority. Margin and Insurance::On getting approval , the party shall be informed and advise to deposit the requisite margin as stipulated in the letter of approval of the authority. Transmission of Letter of credit : The letter of credit on its presentation should be properly checked and signed by two officials and sent in duplicate to the nearest branch of the bank at supply point or to supplier’s bank under registered cover for onward delivery to the supplier. Realization of L/C opening charge: Opening charges (commission and postage) shall be realized from the account of the client and credited to the respective head of account i.e. Steps at Advising/ Negotiating Branch: The advising /negotiating branch on receipt of the L/C should. Enter particulars of the L/C in register. Delivery original copy to the beneficiary. Realize advising commission as per schedule. c) Steps to the adopted L/C by the branch opening L/C: When documents are received by the branch under inland L/C opened by them and the documents conform to the terms of the L/C, entry shall be made in the IDBC register under intimation given to the applicant for immediate payment/retirement. Documents are properly checked and if found in order, the same shall be entered in O.D.B.C. register. Documents shall be sent for collection to the branch opening the L/C. Checking of documents by the opening branch: Documents shall be scrutinized by the opening branch to see that these are drawn in terms of L/C. If found in order, IBTCA for full amount of the bill should be sent to the branch forwarding the bill. Reversal of L/C liability centre: At the time of retirement of the bill liability entry passed at the time of opening the L/C shall be reversed. Letter of Credit defined : A letter of Credit (foreign) is a written undertaking given by a bank on behalf of its customer (importer) to pay up to certain amount to a supplier (Exporter) of another country within prescribed time limit or to the order of a third party (beneficiary), or to accept and pay the bill(s) of exchange (drafts) drawn by the beneficiary or authorize another bank to effect such payment or to accept drafts or negotiate stipulated documents provided that the terms and conditions of credit are complied Foreign letter of credit may either be clean or documentary. Revocable L/C: This type of credit can be cancelled or amended at any time by the issuing bank without prior notice to the seller. In modern business the Revocable credit is not use. Irrevocable credit: This type of credit can not be cancelled or amended by the issuing bank without the agreement of parties concerned thereto. All the credits issued in our country are of irrevocable nature. In modern business the irrevocable credit is very much use. Specific permission/Prior permission/IEC (Import Entitlement Certificate) in case of industrial consumer. Proof of payment of renewal fees for import registration certificate (where applicable). For import of drugs and medicine , valid indent/Performa invoice duly approved by the Director of Drug Administration for import of drugs and medicines. For pharmaceutical raw and packing materials , approval of Block list with corresponding amount from the Director, Drug Administration. Income tax payment certificate/ Income tax declaration/ Tax Identification Number (TIN). Membership certificate from registered organization/ Trade Associations/Chamber of Commerce and Industries. Any other documents as may be required under order from the appropriate authority. The proposed importer is a good and reliable constituent. The constituent is not a defaulter of the Bank nor is the guarantor a defaulter. There is no adverse information about the party/guarantor. The constituent is a man of commitment. The importable item is not banned as per the current import policy. Documents to be obtained: On being satisfied the following papers/documents shall beobtained from the proposed importer. Application of importer for issuance of LCAF (L/C authorization Form). L/C authorization form and L/C application form duly filled in and signed by the importer. 3 copies of indent/proforma invoice/contract duly signed by the importer as a token of acceptance. IMP form duly signed by the importer. Marine Insurance cover note with bank clause along with premium paid receipt. Any other paper/documents that may be requested as per instruction of the appropriate authority. Obtaining approval: On getting the papers/ documents duly filled in, signed by the party and completing all formalities, proposal shall be sent to the competent authority. On obtaining approval of the authority the same may be informed to the importer. All the terms and conditions as embodied in the L/C application of the importer are typed in the L/C proforma in manifold. Entry in Register: If the L/C is found in order , amongst others the following particulars are recorded in the L/C opening register. Merchandise to be imported and the country of origin. Percentage of margin and amount of margin. Amount of commission, postage charge, vat on L/C commission cable/telex/charges and Data max charges. One copy is sent to C.C.I and E.
One copy is retained as office copy. i) Advances against import Bills originate from the lodgment Shipping documents received from foreign correspondents/ negotiating bank, against letter of credit established by the Bank on be half of its customers. ii) These Bills are lodged by debiting PAD Account and crediting Foreign correspondents accounts or any designated bank’s account or Bangladesh Bank’s account (in case of imports under AID/Loan/Credits/STA/Barter where counter part taka funds are required to be deposited with Bangladesh Bank). Invoice in the name of beneficiary (usually printed heading). Name and address of the importer are in conformity with those mentioned in the L/C. Description of merchandise agrees exactly with that mentioned in the L/C. Quantity agrees with that mentioned in the L/C (refer UCPDC Article 39 for tolerance if any that may be allowed). Price & price basis (FOB, CIF,C&F etc.) is strictly as per terms of L/C. Invoice signed properly and presented in correct number of copies. Identifying marks of shipment, number of packages, gross & net weights if any agree with all other documents. Certification, if any, appeared in conformity with the L/C. Unless otherwise specified in L/C, the B/L must state “shipped on Board and clean”. Port of shipment, port of destination, date of shipment, consignee, notify party as specified in L/C. The Bill of Lading /post Parcel Receipt/ Airway Bill / Truck Receipt is drawn to the order and endorsed in favor of the consignee’s bank (L/C opening bank), notifying the opener and L/C opening bank. Must cover merchandise as specified in invoice as well as L/C but it may be described in general terms only. However, the description must not include any additional description terms not included in the L/C. Must be presented within the period as specified in the L/C. The Bill of lading /post parcel receipt / Airway Bill / Truck Receipt contains national freight-paid of freight to pay as called for in the letter of credit. Numbers of packages, marks agree with invoice and other documents. Any alteration to be authenticated by stamp and initial of shipping company of it’s authorized agent. In case of transport, by post / Airway please check that transport by such means is authorized in the L/C. Airways Bill should indicate L/C opening bank as consignee, flight number and date. Caused and state Bill of lading not acceptable. Short form Bill of lading not acceptable unless otherwise stipulated in the L/C. Please check the documents presented and ensure that the same have been drawn strictly as per terms of the L/C. Certificate of origin must be issued by the competent/ recognized body if not otherwise mentioned in the respective L/C. Certificate of origin issued by the supplier usually not acceptable unless otherwise specified in the L/C. Packing list is drawn in conformity with the L/C term for the merchandise as mentioned in invoice and other documents. Weight list is drawn exactly as per weight as specified in the invoice and other documents where price / cost is quoted on weight basis. Inspection certificate is issued by the authorized agent as mentioned in the L/C. A copy of the insurance declaration is attached to the documents which should be sent by exporters to insurance company immediately after the shipment is taken place. All other documents, provided in the letter of credit are received in accordance to L/C terms and conditions. Usance Bills: Sometimes as per terms and conditions of the letter of credit documents may be drawn on Usance basis with maturity of 30,60,90 and 120 days (as the case may be ) after the date of acceptance. Payment and realization of charges: On receipt of payment / replenishment of funds from the paying authority, Tasted Telex may be sent to whom the account of the respective currency is maintained by the Head Office after realizing necessary charges as per prescribed rates of the Bank with an intimation to the collecting bank/ negotiating bank. An Export who has received an export L/C from an overseas buyer (importer) may not be the actual supplier /manufacturer of the exportable goods. he may have to get the goods supplied by some body else or require procuring necessary raw materials either from inland or overseas to process ad manufacturing the exportable items. Under such a situation the exporter may be accommodated with interim letter of credit to arrange for fulfillment of his export commitment either through another supplier or procurement of raw materials for processing/manufacturing of finished goods. This is done by opening a fresh letter in favor of the supplier on the strength of the export letter of credit keeping the same under lien. The opening of one letter of credit backing on another letter of credit is know as “Back to Back Letter of Credit”. This is one of the pre-shipment forms of advances allowed to the exporters/export oriented industries. i) Inland back to back L/C. ii) Foreign back to b back L/C. a) The customer is a valued constituent of the branch. b) He is not a defaulter of the bank or the guarantor (if any) is a defaulter. c) Bank does not have any adverse information about the party. Integrity, credit worthiness and reputation of the exporter are satisfactory. d) The party has got valid export registration certificate issued by the CCI & E and valid bonded warehouse license issued by the custom authority. e) The constituent has got valid irrevocable unrestricted export L/C obtained from reputed foreign bank. f) The party has no liability with other banks in respect of the specific business. Forwarding proposal: If export L/C issuing bank is not our correspondent, (Which must not exceed the permissible percentage of the F.O.B. value of the export L/C as may be advised from time to time) shall be sent to the sanctioning authority with specific recommendation of the branch manager. a) Prayer of the party. b) Copy of export L/C. c) Copy of indent/proforma invoice supplied by the exporter, in whose favor import L/C is to be opened. d) Credit report of the party. e) All other paper/documents as required by the sanctioning authority. Approval of. If the papers sent by the branch are found to be adequate and in order the competent authority may approve the loan proposal and advise the branch accordingly. Opening of the L/C: Letter of Credit shall be Issued incorporating all the terms and conditions of the deal and stipulating the documents to be submitted. the liability voucher shall be passed and L/C. commission realized and credited to income account. Although no specific reference to other documents is made in the UCP, it is important that these documents also satisfy the credit conditions. It should be mentioned once again that, failing specific instructions, banks will accept other documents as they are presented as long as the requirements stipulated in Article 13 and 21 of the UCP are fulfilled. Final Step: Submission of the documents to the Bank for negotiation. Membership in and/or utilization of ICC Commercial Crime Services. SBL is well positioned to meet the challenge and will seize the opportunity of benefit from economic growth. The bank would serve as partner and advisor of the clientele to trade, commerce and industry. This strategy is supported by wide spectrum of products and services. The mission of the bank is to be utmost trustworthy stakeholder, careful, committed for equitable and sustainable growth based on diversified deployment of fund/resources leading the bank to the peak of healthy and wholesome financial institution. If the bank is going to succeed internationally, we must know as much or more than our customers and our competitors. A single misstep may not only cost our company business, it can lead to big delays and stiff fines. Unfortunately, most information about international trade is targeted at big companies with large logistics and legal staffs that know how to navigate the maze of import-export rules and regulations. Small and midsize companies lack the resources – and often the training – of larger corporations. The bank is maintaining a well-structured communication from top to bottom level. Each official should be valued and treated as a part of the bank and they must have the privilege to devote themselves for the betterment of service of the bank. SBL places utmost importance on managing foreign exchange. The whole process includes management of export, import, remittance, Foreign Exchange Risk, and successful completion of trade. The bank always tries to increase its foreign exchange. Every year this branch of SBL contributes 15% of total foreign exchange. As the bank is located in commercial area it is a great opportunity for the bank to attract customer. Though it has some problem with its foreign exchange department, it is always trying to accelerate its foreign trade. The 9 years success story though helped the bank to attain a leading role but to remain unrivalled among new generation banks, the bank must face new challenges. There are some qualified Executives & Officers to handle Import & Export Business efficiently. SWIFT service for faster Transactions & communications. Customer satisfaction is great concern. Inter personal relationship is great. For not Introducing E. banking fully. Marketing & promotional activities is not well set up. For not implementing online banking. Poor foreign correspondent relationship and Branch net work. KYC process not implemented properly. “Core Risk in Banking” not followed meticulously. Want of Highly qualified and dynamic leadership. Organizing seminar, workshop marketing on regular basis, can increase promotional activities. Can set up more correspondent relationship & Branch network in potential areas. On line, E. Banking, ATM, Credit Card can be introduced fully on urgent basis. Foreign Exchange Business can be increased to a great extent. Strategies/policies to be adopted matching the changing needs. Other bank use new technology which make a difference. Foreign exchange operation of the bank played a significant role in the overall business of the bank. During the year 2006, the bank has contribution in the country’s national economy after successfully handling of foreign exchange transaction viz. Import, Export and Remittance. The volume of total foreign exchange business has significantly increased from tk. 25879.68 to tk. 34003.77 million, which is 31.39% higher than previous year. There are some recommendations for the improvement of the service and faster the service of the Branch. If they establish networking system within their branches then it can easily transfer data within a short period of time. In foreign exchange department it is require communicating with foreign bank frequently and quickly. To make the process easy and quick the whole bank should be computerized and use faster communication system. They should use computer instead of register to keep record of transaction and foreign exchange documents. It should open new branches for increasing its customer. It should take some steps to increase its volume of foreign exchange because it is declining from the last year. Bank should start ATM service as soon as possible. Bank should use faster internet service for speeding its work. In foreign exchange department it is required to communicate with foreign banks and other international organization. To make the process easily, modern communication system such as e-mail, fax etc. is used. Bank has these equipment but not satisfactory enough. Modern technology is not used to maintain documentation in this bank, yet they are using register based document. Lack of manpower in Foreign Exchange Department. In export division of Agrabad branch there is lacking of manpower. The manpower of that section is not sufficient for prompt service. Time consuming nature to find out old documents easily for using register based document. The bank does not follow online banking system so that customer can not get faster service. Customer also faces problem in anywhere banking. Lack of available branches in remote areas of business and services. There are few packages to attract its customer. Though the foreign exchange volume is increasing in the bank but import and export volume is declining in this branch relative to the previous year. Internet service is not satisfactory. Sometimes it may create problem to work as such the speed of work become slow down. All the employees are not well trained to handling technology such as computer, internet etc.